Jon is using Smore newsletters to spread the word online. This concept is reinforced in an article by Jacob Share from May 25, 2017 of Livecareer.com, which states that “Degrees and credentials are important, but the development of soft skills is a crucial part of fostering a dynamic workforce.” As a result, Heartland Career Center is placing emphasis on integrating soft skills throughout the curriculum and learning experiences, recognizing that these skills are transferrable to any career our students choose to pursue. With this in mind, our teachers are providing opportunities for students to develop soft skills by placing them in environments that students are able to practice these skills. Some of the experiences include providing learning environments within our building where student interact with outside customers. 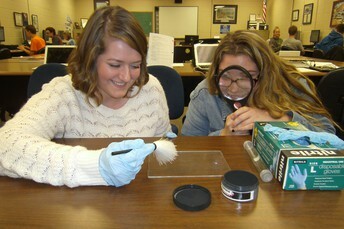 Examples of these activities can be found in cosmetology, auto service, auto collision and construction. While other experiences lead to working outside our facility in internships, placing the student in a much more realistic learning environment that cannot be replicated in the normal classroom setting. Regardless, all of these opportunities prepare the students for the work force whether they want to pursue more education or go right into a career. In either case, Heartland Career Center students are learning technical and soft skills that allow them to be prepared for the next step of their future. As we start the second semester, our students and instructors continue to enhance their skills through classroom activities, internship opportunities and student competitions. This is when many of our students begin gearing up for regional and state competitions. 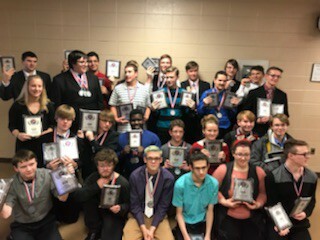 The Heartland Career Center BPA club has already held their regional competition, in which, 39 of our students competed. Twenty-one of those students qualified to move on to the state competition. Also, regional SkillsUSA and ProStart competitions will be taking place in the next few weeks. These student competitions serve as a great extension of our classrooms that provide students with a great way to showcase their abilities in comparison to their peers from across the state. We are proud of our students and look forward to their competition experiences. 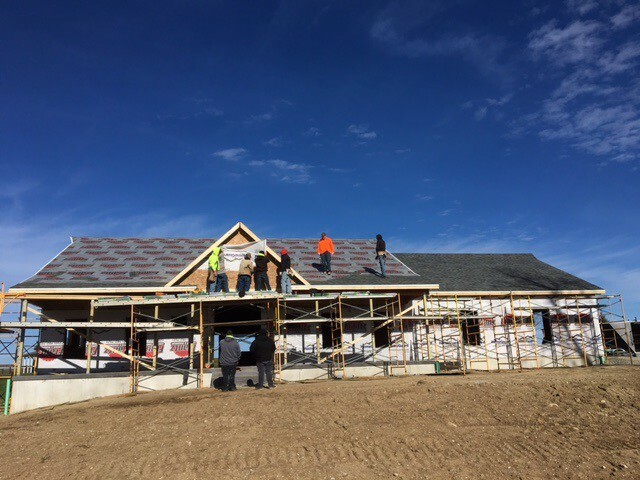 For the 2017-2018 school year, the Construction Trades Technology class will be spending their time at the project site located at 4062 E 200 N, Lagro, IN. This year’s project is a 2000 sq. ft., one story, 3 bedroom house with a full basement and 3 car garage. 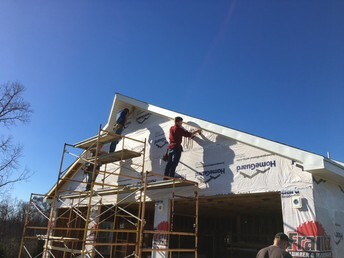 The Construction Trades Technology program is a combination of classroom and project site experiences concerned with all aspects of the erection, installation, and repair of buildings, homes, and other structures using assorted materials such as metal, wood, brick, concrete, or composite materials. The skills that are emphasized include: precise measuring, cutting, fitting, fastening, and finishing various materials. 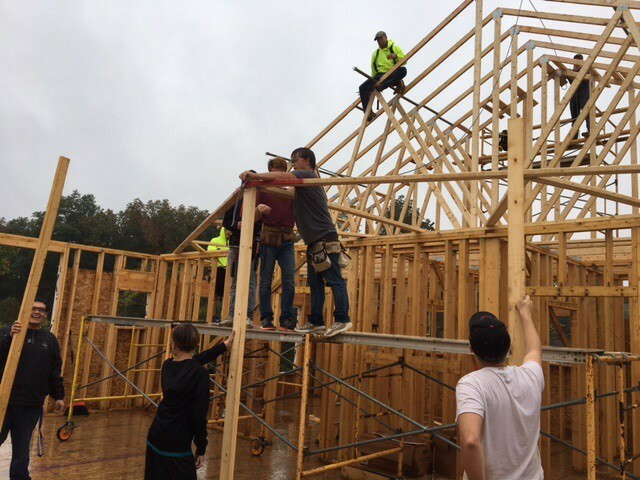 Each student brings in their own hand tools, but each is also exposed to a variety of tools they may experience on a regular construction site. A student who is wanting to take this program will also want to develop their reading skills as well as oral and written communication skills to ensure his or her ability to accurately interpret instructions and provide information to customers and colleagues. Safety is always a number one priority and many of the students have chosen to pursue the on-line OSHA10-hour certification in Construction Safety and Health. Additionally, all students are offered the opportunity to sign up for free college credits – totaling 12 dual credits over two years. 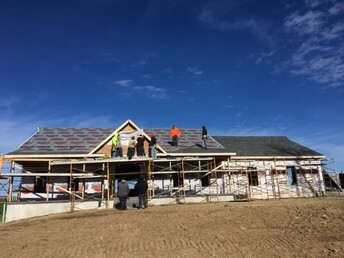 These are offered through Ivy Tech’s construction program and match their curriculum. 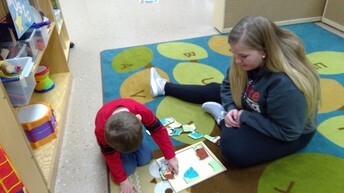 Students in the Early Childhood Education class are learning to become teachers. 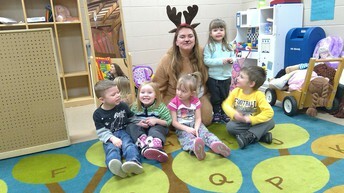 Students work in the Heartland Preschool where they create and implement lesson plans. 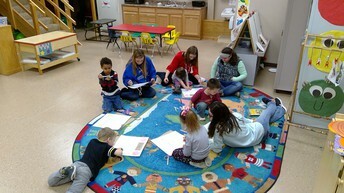 The students are trained on how to use the Indiana Early Learning Foundations. First year students all work in the Heartland Preschool. The second year students have the option of working in the preschool or doing and internship at another early childhood setting such as a daycare or an elementary classroom. 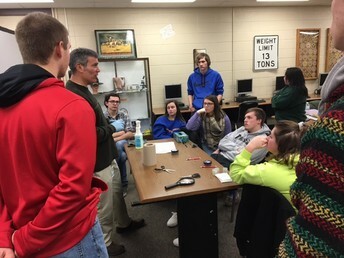 In November, the Information Technology lab, students geared up for Techfest contest. We sent 23 students to Techfest to compete in various events. 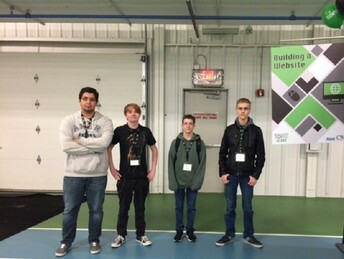 Our lab represented Heartland Career Center very well by taking First Place in the Computer Security. This is our second year in a row taking first place in the Security and Networking area. The Computer Security Team took first this year with a perfect score. Congratulations to River Lehman-Bigham, Grant Abell, and TJ Layne. Our lab will now focus on Business Professional of America and start to get ready for the State Leadership Conference at Heartland Career Center on March 11 - 13, 2018. 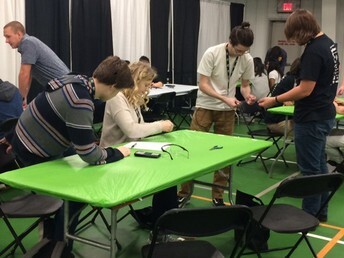 Students will be competing in various competitions such as Computer Security, Networking, PC Service and Repair, along with Interviewing, and other presentations. Students will be competing to earn an opportunity to go to Dallas, Texas at the National Leadership Conference May 9 - 13, 2018. Students are learning about how computers communicate across the network, computer components, network media, hardware devices, number systems, IP Addressing and Subnetting, along with programming. These skills will allow the students to compete competitively in Business Professionals of America. As first-year students in the Criminal Justice Program continue to discuss Introduction to Criminal Justice, second-year students are actively engaged in Introduction to Criminology, a year-long course of instruction. Both classes will also earn additional college credits as they complete Current Trends, Issues, and Topics in Law Enforcement. During each semester, students earn free college credits from Vincennes University and gain a wealth of background knowledge in the many career opportunities within the criminal justice field through classroom discussion and guest speakers. Students welcome guest speakers from various criminal justice professions to compliment the classroom discussion: Judges, Chiefs of Police, the Chief Probation Officer, Prosecutor, Indiana State Troopers, and Corrections Personnel, to name a few, routinely visit our classroom. Field trips to the Miami County and Wabash County Jails, and the Wabash County Courthouse will provide students with a better understanding of the criminal justice system. We are privileged to be the first Indiana Career Center to receive a VirTra V100 Training simulator from Vincennes University. This simulator will allow students to learn decision-making skills, recognize “shoot-don’t shoot situations,” and experience firearm safety without using real ammunition. This technology is state-of-the art and local law enforcement agencies will be afforded the opportunity to use our classroom for training. During last semester, students used their observation and investigative skills as they engaged in a “Body Farm Lab Experiment.” Students observed and documented the decomposition of dead piglets that were in various stages and situations. They were asked to develop theories and validate them throughout a two-month lab exercise. 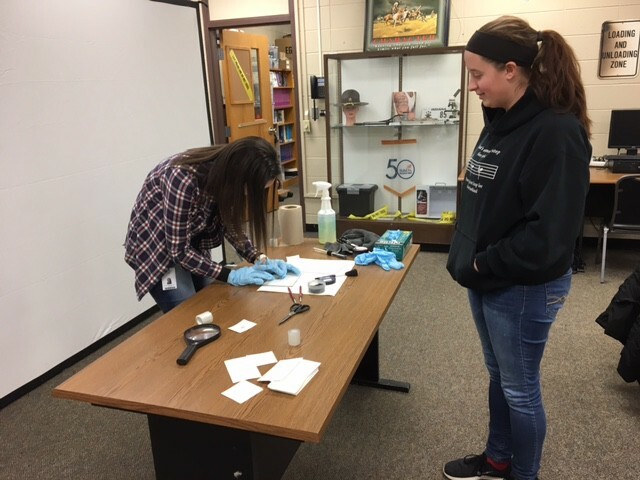 This experiment replicates realistic scenarios and generates discussion and the formulation of theories as students prepare for this semester’s Introduction to Criminal Investigation course. Inviting all companies, businesses and schools to participate in the second annual Northeast Indiana Career Expo 2018 on May 2nd at the Wabash County YMCA and the Honeywell Center of Wabash, Indiana. The event is sponsored by Heartland Career Center and the following volunteer committee partners in business and education: The Community Foundation of Wabash County, The Honeywell Foundation, Economic Development Group of Wabash County, Ivy Tech Northeast, Wabash Campus, Southwood High School, Vincennes University, Wabash County Purdue Extension, Wabash County United Fund, Wabash County YMCA and Wabash High School. · Provide real world interactions/experiences in career exploration. · Offer Interactive booths/displays to learn about specific careers. · Focus on an emphasis of career soft skills employees need to succeed.